I used these colors: Light blue number 173 about 83 g, dark blue number164 about 20 g, the little amount of pink number 225 and sand number 404. 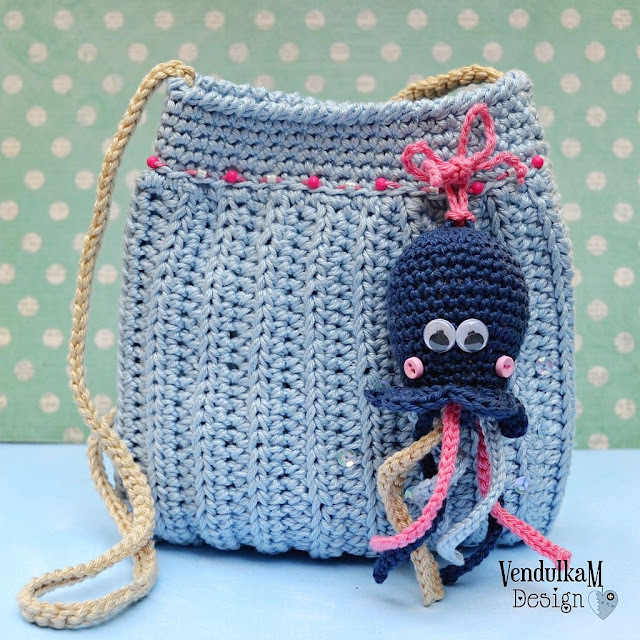 You will crochet the purse using two threads of yarn and hook 3.5 mm. The gauge of the pattern 21 stitches in 4 inches. 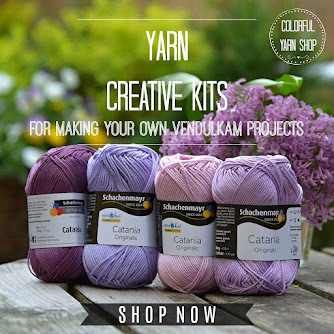 You will need about 105 grams of yarn in total. Hooks: 3,5 mm for all purse and 3 mm for last round of the upper brim. The finished purse is 18 cm (height) and 15 cm (width in the widest point). 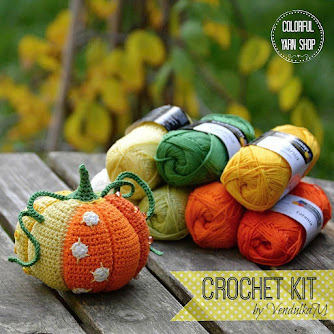 Please remember, that the size of the finished project depends on the used material and your own style of crocheting. 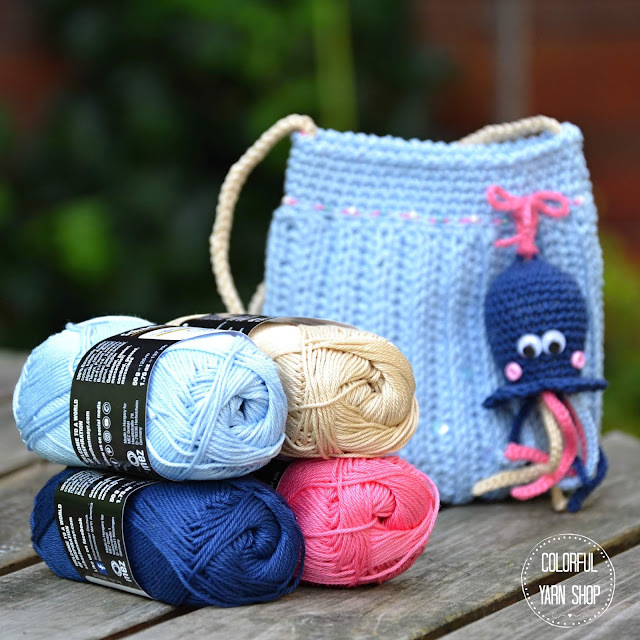 Use two threads of yarn, hook 3.5 mm, use light blue color. Crochet in rows, back and forth. Row 1: starting in the 2nd chain from the hook, SC in every chain along (51 SC), CH1 as a turning chain, turn. Row 10 – 15: repeat row 9. Stitching into back loops only. Row 23: 1 SC in back loops only in each stitch from the previous row, (51 SC), end the work. 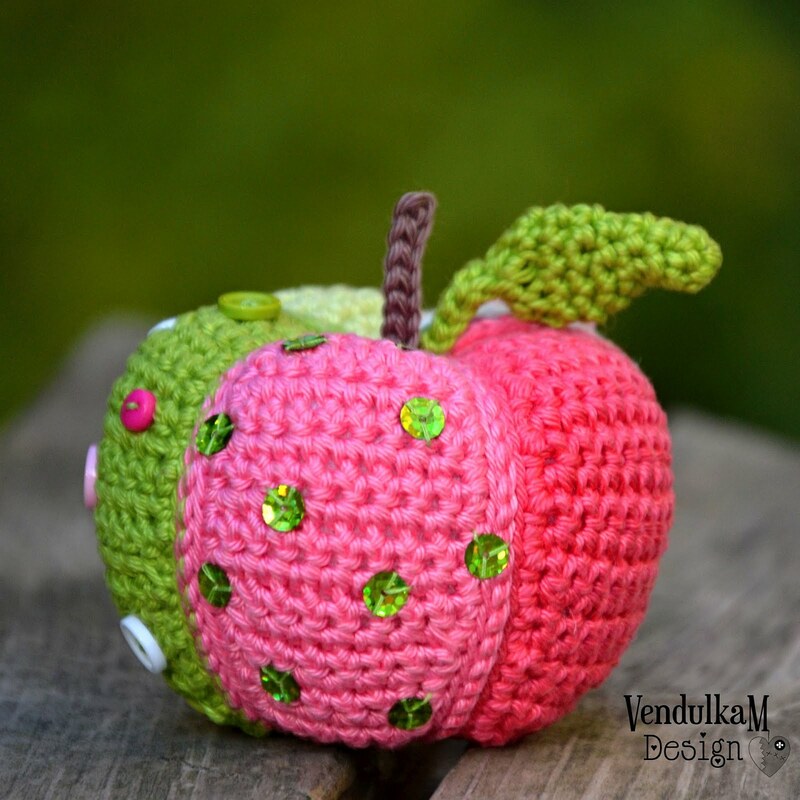 Fold the piece in half and crochet the edges together using SC into each of the 25 stitches, 1 SlSt in next stitch, end the work. Turn the purse to the right side. 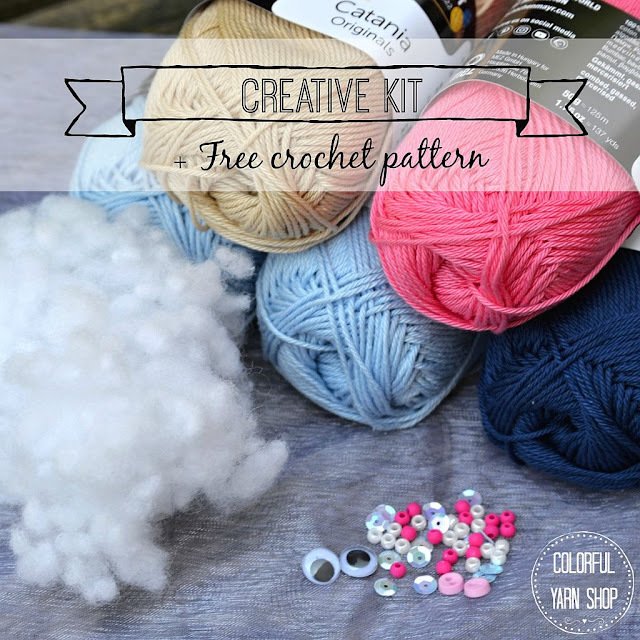 Use light blue yarn, 2 threads and hook 3.5 mm. Crochet in the round. Round 1: Insert a hook in the side seam and crochet 1 SC in each stitch around, join the first stitch with 1 SlSt (48 SC). Round 2: 1 SC in each stitch around, but you will crochet in back loops only. Join the first stitch with 1 SlSt (48 SC). 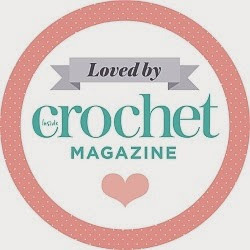 Round 7: Using only one thread of yarn, use hook 3 mm and crochet 1 crab stitch in each stitch of previous round, end the work. Neaten free threads and shape the bag nicely. I made 86 cm (33.8 inches) long strap, wearing the purse across the body. Row 2: insert a hook in the second stitch from the hook and make 1 SlSt, then make 1 SlSt in every stitch from the previous row, end the work. Neaten free threads nicely. Sew the strap inside the purse. Neaten free threads. Sew blue spangles/ sequins on the purse. Use common sewing thread and needle. Use tapestry needle and some contrasting yarn and embellish the upper brim by beads. I use Toho beads: beads size 6/0, average 4 mm. 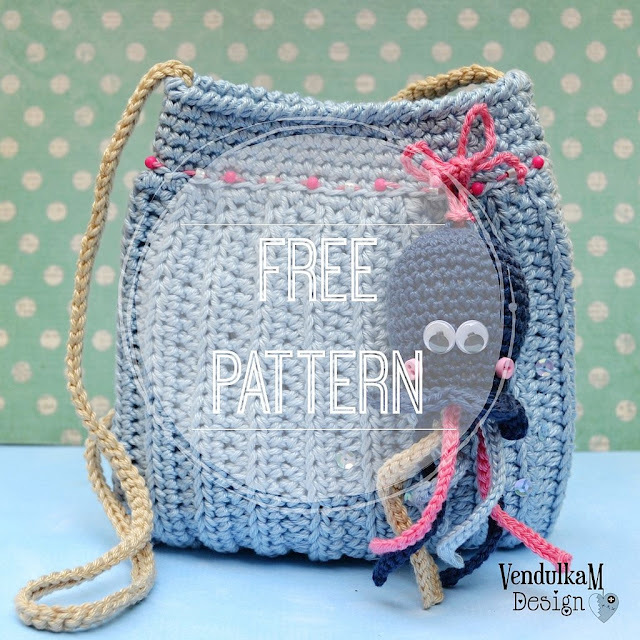 Gorgeous crochet bag for summer, my dear! It looks so fresh and smart. Thank so much for sharing the pattern with all of us. This one is going to my "To Do List", that's for sure! And also I'd like to include this project (one picture plus link) in my next "Summer Round-Up post" that I'm going to publish in my blog today. Have a lovely Sunday, dear!